In my town, there used to be a Borders bookstore every few miles, until a few years ago, when they all started to disappear. I’m not hunting them down or anything, so it’s not like I know exactly where they are today, but the only one I’ve seen recently is downtown by my old work. Otherwise, I haven’t seen them around. 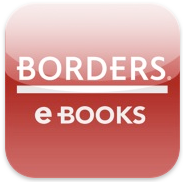 That makes me wonder how well Borders is doing, but not enough to actually research it in any way. What I do know is that they just released an e-reader app, in the same vein as the Kindle and Barnes & Noble apps, for both the iPhone and iPad [iTunes link]. So how is it?